In a small saucepan, bring the lychee syrup and ginger to a boil. Remove from the heat, cover and let steep for 30 minutes. Meanwhile, stuff 16 lychees with brandied cherries. Set each lychee in the cup of a mini muffin pan or in an ice cube tray. Strain the lychee-ginger syrup and pour it over the lychees. Freeze until firm, at least 4 hours. Meanwhile, in a pitcher, stir the sugar into the lime juice until dissolved. Refrigerate until chilled, about 1 hour. 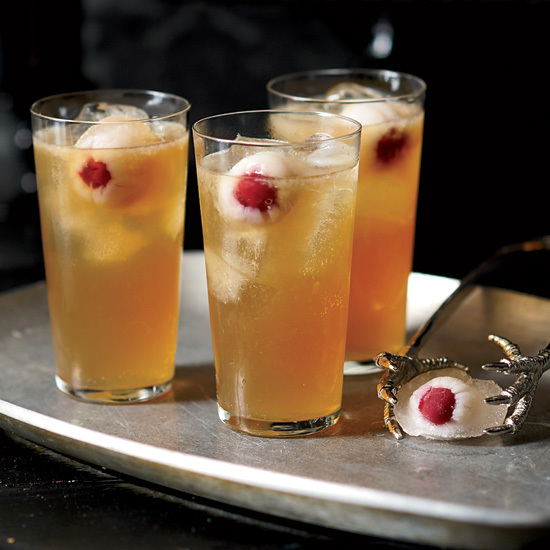 Unmold the lychee ice cubes into a small punch bowl. Pour in the lime mixture. Add the ginger ale or other soda, stir gently and serve in ice-filled glasses. The lychee ice cubes can be frozen for up to 1 week.